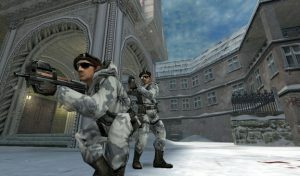 Counter Strike: Condition Zero was originally released on the 1st of March 2004, much to critical acclaim. As part of the Counter Strike franchise, it comes as no surprise that it’s an incredible FPS game. While it might be a title that’s starting to show its age, it is still just as solid as the day it was first released. Condition Zero is one of the few Counter Strike games that actually has a campaign, and an enjoyable one at that. Alongside the extensive campaign, there are also 12 bonus single player missions to try out before hopping online. Just like any Counter Strike title, the real meat of the game comes in the form of the online multiplayer. This is a statement that has yet to change, even with Condition Zero. 14 years of Counter Strike later and Condition still has solid controls and tight gameplay mechanics. Despite the dated visuals, they still hold up to some degree in 2018, but that isn’t what keeps players coming back. The fact that the game plays like a dream for everyone makes it an ideal FPS experience. Thanks to the variety of weapons, game modes, and online servers, there’s always something new to do. With the servers, there’s a near limitless selection; many of which have their own set rules and systems. Due to these changes, each server you could go on could play uniquely to the regular. Typically, though, it means you’re going to enjoy a wide variety of maps that no other shooter has. All in the same day you could defuse a bomb in The Simpsons home and take down a group of hostiles in the classic Dust 2 map without even realising. No updates or DLC have been written by us for Counter-Strike Condition Zero. No mods have been written by us for Counter-Strike Condition Zero. Why not let us know if you have a mod you would like featured in this section.